Amenities: Full kitchen with commercial & small fridge, 5 burner gas stove & large oven, microwave, 20 – 2.5 feet x 6’ & 60 chairs. Casa Del Mila Oro has everything you need for weddings, special events, and conferences. Lakeside beach for weddings & receptions. Plan your dream wedding at Casa Del Mila Oro Resort. Beautiful beachfront resort for you and your guests to enjoy. 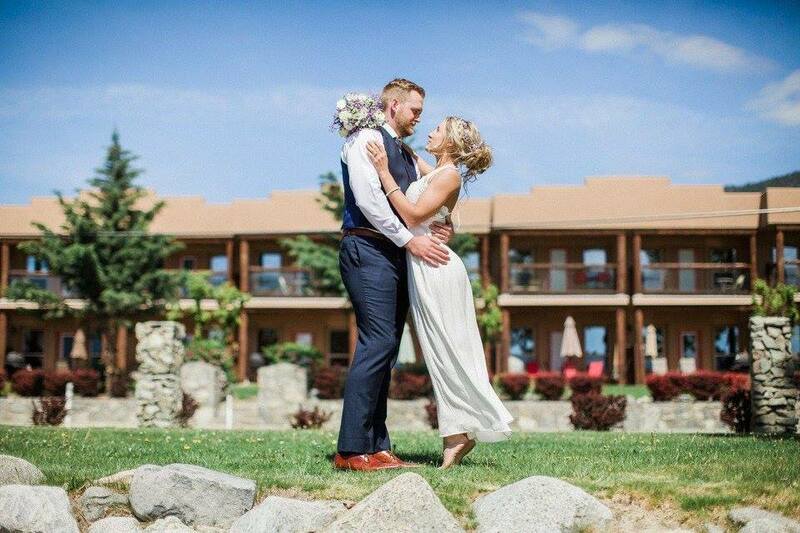 Picture your dream wedding on our beach front, overlooking the lake, then for your reception move over to our poolside ballroom, seating up to 80 guests. Amenities: Water feature, fire pit, outdoor kitchen, pizza oven, dining tent, beautiful location for wedding photos. The lookout Osoyoos is a private acreage that overlooks the town of Osoyoos, home to Canada’s only desert and warmest lake. The venue is available from 10 AM to 1 AM allowing an unrushed day for your event with total privacy. 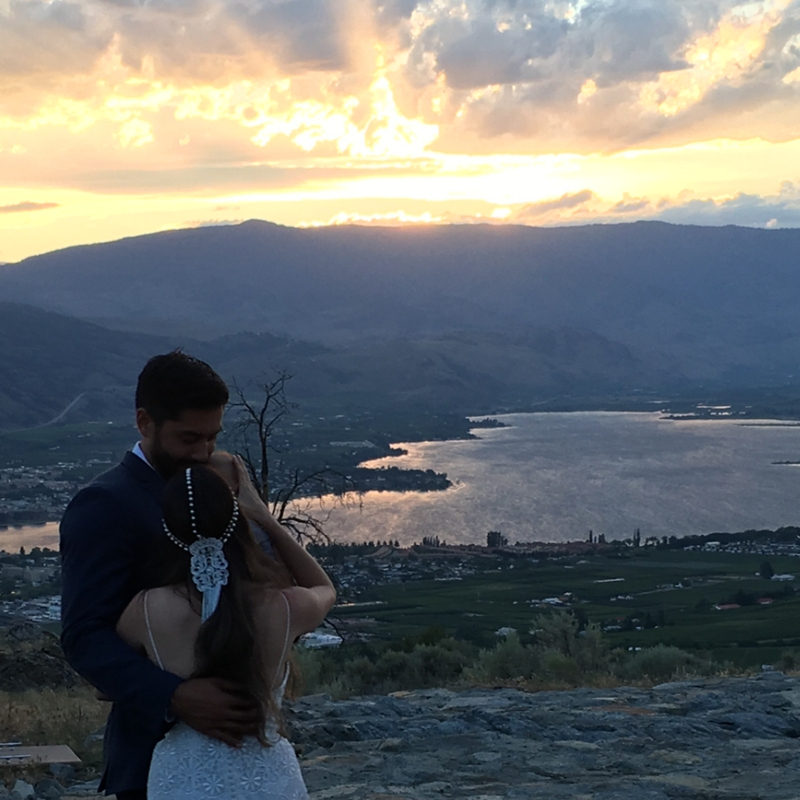 The Lookout Osoyoos is a “one stop shop” that provides a place to have your ceremony and reception, all with a beautiful desert background for your photos! We provide tables and chairs for 100 people. Bluetooth speakers allowing you to provide your own music and/ or outdoor band with with no corkage fees! We offer flexible event spaces for 10 to 225 people with full catering available. Perched high above the Town of Osoyoos and sculpted in the environs of a desert mountainside, guests will be captivated by views of Osoyoos and its surrounding orchards, vineyards, and Lake Osoyoos below. The Osoyoos Golf Club brings together ideal desert climate and picturesque golf with two full-length Championship courses boasting the longest season in the Okanagan. 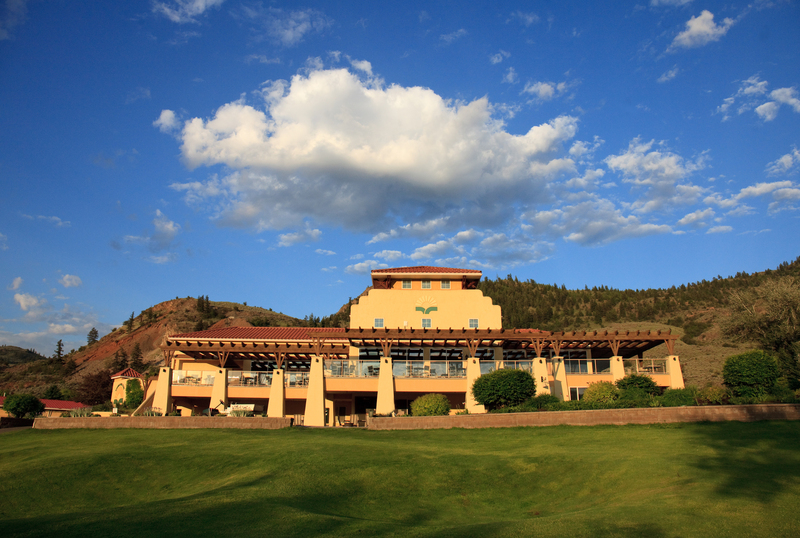 The majestic views of the vineyards and shimmering waters below makes your wedding at Osoyoos Golf Club memorable. Contact fbmgr@golfosoyoos.com or call toll free 1.800.481.6665 Ext 221 for details. Amenities: 226 condo-style guest suites, state-of-the-art meeting facilities, spacious 1,2,3 bedroom suites, 1&2 bedroom Villas, complimentary Wi-Fi, catering services, private beach & beachside cantina, 2 outdoor pools, hot tubs + cabanas, fitness centre, spa, restaurant. There are few places on this earth that are more perfectly situated to celebrate a bride and her family and friends as she embarks on a wonderful new life. 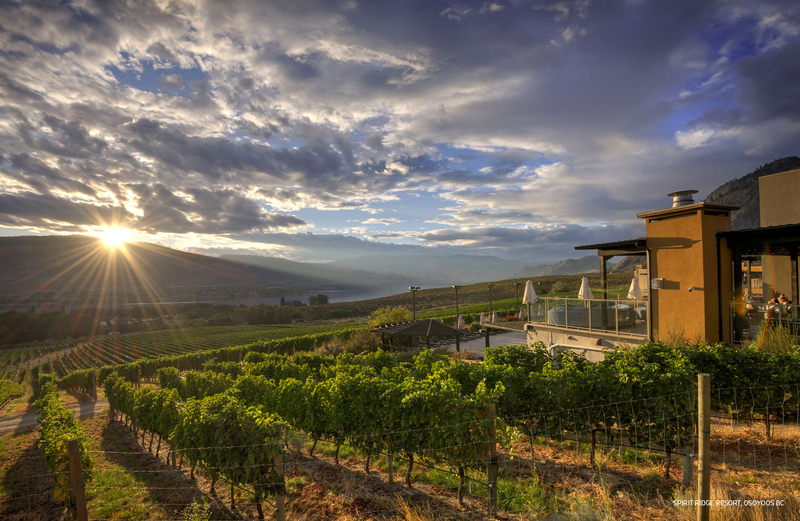 Under the spectacular southern Okanagan Valley sun, overlooking the meticulously aligned vineyard with Osoyoos Lake framing the view-its pure storybook. For her, a distraction free environment where all attention can be focused on her and making the day perfect. For him, a dream come true. Golf, hiking, NK’MIP Cellars winery, fishing, lake activities or whatever else we can accommodate. With activities galore, guests will fill their time with wonderful memories of this special celebration. Our private waterfront location offers a gorgeous and memorable backdrop to exchange your vows. Our 1800 square foot ballroom boasts floor to ceiling windows overlooking the lake and surrounding mountains as the perfect accent to your wedding décor. Our onsite event planner will assist you to create the perfect wedding package to celebrate your love with your family and friends around you. Enjoy a delectable custom catered meal and full bar service as you dance the night away surrounded by all of the people most important to you. Amenities:Catering, Lakefront Wedding beach and parklike setting, outdoor reception lawn, Award winning restaurant and patio, licensed pool bar, guest suites available. Your Wedding. Your Way. Imagine your ceremony under the canopy of trees overlooking the 1000 feet of sandy beach… Small and intimate, or Elaborate weekend-long destination weddings, complete with rehearsal dinner, breakfast, ceremony, reception, and gift opening to elegant and simple small affairs, Watermark Beach Resort is a favourite wedding venue for couples and their guests. Our commitment is to create the wedding of your dreams. 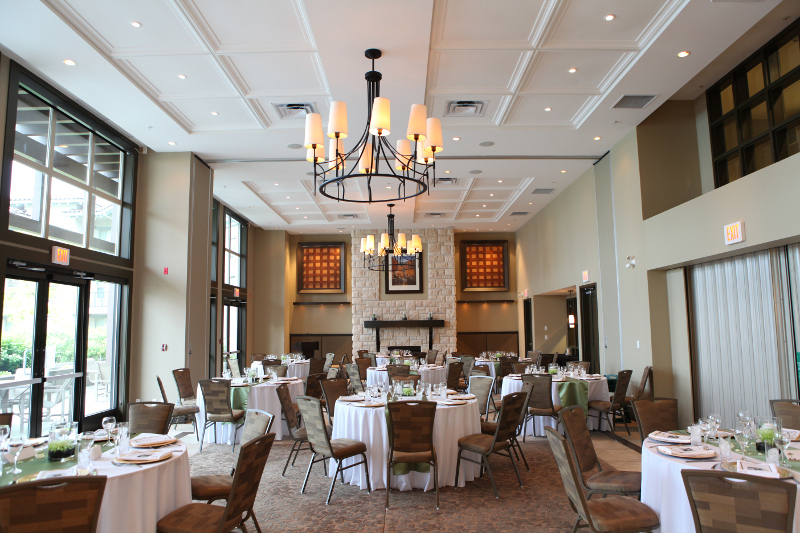 With 153 suites the resort can accommodate your entire wedding party room requirements, and groups of up to 150 are easily accommodated and taken care of by the resort’s team of experts who will ensure that no detail is overlooked.